Now the Bar Muscle ups were with a band. And yes-these WOD's took me quite a long time. The 2 pistols and 2 hand stand push ups every minute on the minute (emom) seriously slowed me down on the second one. So the beginning of this week went really well. I was able to work out, I was in very little to no pain and I felt like this ankle wasn't going to hold me back too much. And then came Wednesday and the announcement of 13.3. I have to be honest I was bummed. After attempting one legged double-unders for way too long and failing over and over I started to get really bummed. In my mind with the way my ankle was recovering I would be able to lose the boot for the Wall Balls and get through them but then by double unders I would be screwed. So when I woke up Thursday I was getting more and more upset. I also had to end an internship that I was doing in order to get hours toward my licensure (I have my Masters in clinical psychology and have been unsuccessfully attempting to gain hours towards my Marriage and Family Therapist License). So not only was my personal life sort of falling apart so was my work out life. And then it happened. I was getting out of the shower and attempting to hop around to get dressed and had placed my huge 2 pound boot on my bed. One mis-hop and BAM. The boot fell off my bed and landed directly on my bad ankle- exactly where it was swollen the most. Talk about horrible pain. Like really horrible pain. So then my week really went downhill. My ankle hurt worse than it did right after I rolled it. 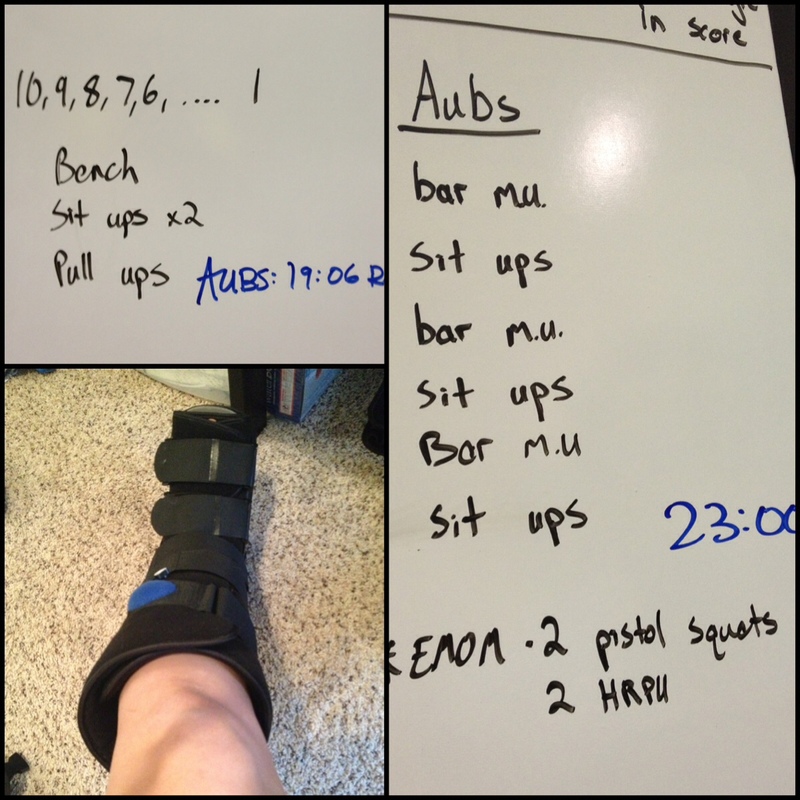 I was 2 days away from attempting 13.3 and I had to go back to crutches (which I had been off of for days). Thursday night I woke up several times because it was so uncomfortable with just the covers on top of my ankle. Friday was the same. So when Saturday rolled around I was worried I would even be able to do 1 wall ball. On top of all of this I was starting to eat like crap again because I was so upset. Did that help? Of course not. 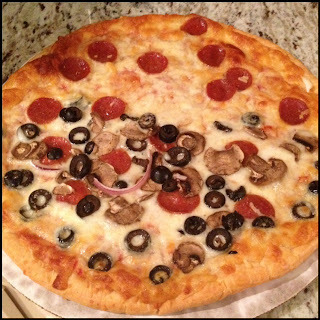 Crappy food makes you feel worse on every level except for that false sense of happiness you get while eating it which immediately goes away once you are done. So here I was. Feeling depressed and weak and looking down at a 14 pound wall ball. I did the WOD and I got 130 reps. I am my own worst critic so I was very upset with this score. I know I have a sprained ankle. I know I probably shouldn't have even tried, but still there is that little voice that always comes up after what I consider a bad performance, "that wasn't good enough. You should have got more." I hate that little voice and I honestly kind of like it. I hate it because it stops me from actually sitting down and being proud of my myself when I deserve it. Why in the world do I like it? Maybe it's because I have played sports my entire life and I am just used to it. Maybe it's because I am too competitive. What I think is it keeps me working. It keeps me striving for more. To do better. To push myself. To not be satisfied when I think I had more in me to give. No matter what the reason is it's there and sometimes it's too much. This weekend when I was already feeling down on myself it was too much. I got in the car and cried. Thinking back it's really ridiculous I let myself get to this point. Usually when I am feeling sad/annoyed/angry/any negative emotion my coping skill is working out. It is my release. It is my way of thinking of nothing but the WOD in front of me and ignoring all the outside world. So having that coping skill taken away from me at some extent with being injured really caused me to get to the point where I was being hard on myself for only getting 130 reps on one leg. I mean seriously? I did 130 wall balls 90% on one leg. And instead of stepping away and thinking- wow good job self I was disappointed for not getting more. That is not okay! And after having Sunday and today to think about it I have decided I need to reign in the negative self talk and only use it to my advantage because Saturday it was a disadvantage. Now I can say I am proud of myself for even attempting the workout and I am super proud of score. My goal for the remainder of this injury and for the remainder of my workout life- is to recognize that I need to be more positive to myself. After every workout I need to make a mental note first of what I can fix/technique/etc. but then to take the time and congratulate myself on the wins. What did I do well? I really think this will help me improve not only as an athlete but as a person. Enough with the deep talk- have I ever talked about how much I love Against the Grain products? I'm just kidding I know I have and sound like I work for them as salesperson. 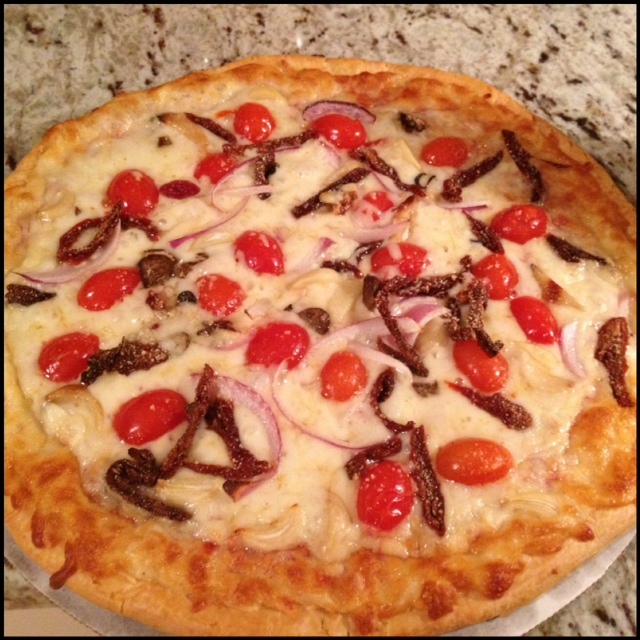 Saturday night I was craving more bad food so instead of getting a normal pizza we opted for a couple of Against the Grain ones (Paleo + dairy). I went to the Whole Foods salad bar and got some toppings- tomatoes, roasted garlic, onions, more cheese, olives. mushrooms, etc. and baked a couple. They were awesome. I will add more to the list as I try out more things I can do! 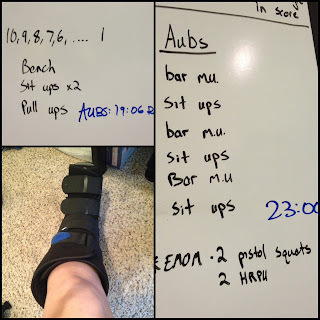 So I will end with some positive notes: I am happy that my ankle is allowing me to work out at all, I am grateful for my CrossFit community and all of their support and I feel blessed to have such a wonderful life even if I allow myself to get in the way of recognizing it sometimes.